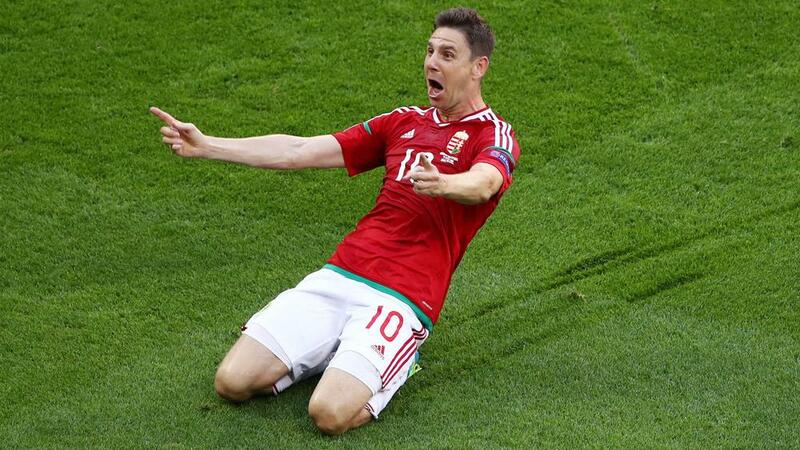 Zoltan Gera claims Hungary will be "free of pressure" when they come up against Belgium in Toulouse on Sunday. Marc Wilmots' 'Golden Generation' carry the tag of favourites into the game and, while the Belgium boss insists it is a label that sits well with him, experienced midfielder Gera is hoping it preys on the minds of the Red Devils' players. "Of course they are favourites, they have progressed over the years with the excellent players they have," he said. "The pressure is on them so we'll be free of pressure as we have already met our goals which was to qualify from the group. "We will try to enjoy the game, it may be our last one here. We'll give our maximum." Gera's long-range drive against Portugal on Wednesday was voted the goal of the group stage and he believes having players who can do the spectacular is a useful attribute in tight matches. "I didn't vote for myself," he joked, "but there were some wonderful goals in the group stage. "You have an advantage when you have players capable of scoring from long distance. In our team we have several players who can do this. We will have a very structured Belgium defence in front of us so we will need those long-distance shots." Hungary boss Bernd Storck is hoping his team can marry defensive frugality with offensive efficiency against Wilmots' men. The German said: "We are very happy to qualify for this round of 16. I think we deserved it, we have played good football and progressed from the first game. "Tomorrow we play against one of the favourites, they are an excellent team. We need to concentrate on our qualities, be disciplined and well organised in defence and clinical in attack." That 'Golden Generation' tag will become a hindrance should Belgium fail to live up to expectations, but Storck was not willing to provide a deep analysis of Sunday's opponents. "I don’t have to judge whether they're the 'Golden Generation', I don't know but all of them play at top clubs, world class clubs," he added. "It's not for me to judge the way they’ve played, they had a very difficult start against Italy but you can easily lose against them. They have got better, evolved from game to game and tomorrow will be a big challenge for us."